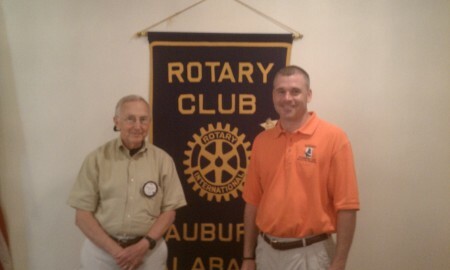 On June 5, Dr. Stephen Ditchkoff visted Rotary to discuss the wild hog problem in Alabama. The research is focused on species-specific contraceptives successfully controlling the population, as hunting and trapping does not seem to hold the answer. Pictured from left to right is Bill Walsh and Dr. Stephen Ditkoff.